Accra, April 14, GNA - Dr Nyaho Nyaho-Tamakloe, one of the two government nominees who entered the race to contest the chairmanship of the Ghana Football Association (GFA) was on Wednesday elected as the new Chairman of the GFA for a three year term of office. He polled 30 votes out of the 33 voters present at the elections to win the chairmanship slot with three abstentions. 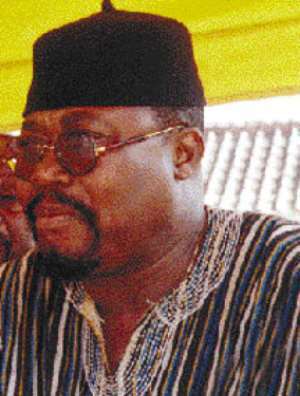 Dr Nyaho-Tamakloe, a 61 year-old medical practitioner and former Chairman of Accra Hearts of Oak Sporting Club is credited with raising a youthful side "the Musical Youth" in the late 80's to compete in the then National First Division League after sacking an entire playing squad of Hearts. Dr Nyaho-Tamakloe and Mr Kofi Amoah, Chairman of the 2008 Nations Cup Bid Committee were nominated by the government to contest the elections but the later withdrew few minutes before the start of the elections citing tight business schedules for his withdrawal. Mr Amoah now becomes an automatic member of the GFA Management Board together with Mr Aloysius Denkabe of the University of Ghana. The Ghana League Clubs Association (GHALCA) will also provide two more members to the Management Board to make the total GFA management board to five at an election scheduled for April 27. In his acceptance speech, Dr Nyaho-Tamakloe said he is assuming office at a critical time in the history of Ghana football when the association has been bedevilled with litigations and a clumsy domestic and international calendar. He said the nation therefore finds itself in a messy situation, which requires extra energy and commitment to over come it, adding that, "We have no time to waste on unnecessary acts of fault finding and vilification". The new chairman who is noted for his strict disciplinary approach to administration said the Five Year Development Plan initiated by his predecessor would be continued in earnest in order to provide quality players for the clubs and national teams. He said " This matter is of grave concern to me because of the attitude of the some of our so called professional players who delight in holding the nation to ransom." "The nation needs adequate supply of players who are imbued with appropriate dose of patriotism to replace the arrogant and indiscipline players who think they are indispensable" Dr Nyaho-Tamakloe added. Dr Nyaho-Tamakloe announced his intention to curb the incidence of bribery in the game, adding that, the GFA will work closely with the security agencies and the intelligence service to track down corrupt elements to expose them from the system.